Bhetala - Whose is the sinner? There existed Sarveshwara Puram on the banks of Holy River Ganga, once upon a time. A Sanskrit Pandit named Vishwanatha used to live there. He was blessed with a son after a dear long time. Naming his son Gunanatha, Vishwanatha groomed him very fondly and affectionately. Vishwanatha trained Gunanatha all the Sastras he knew and made him knowledgeable on par. Gunanatha with his father's encouragement emerged victorious at almost all the places he competed with learned persons at various Kings' courts in logical and reasoning subjects. With the progression of time, Gunanatha kept his father's hopes winning name, fame and laurels. So on, Gunanatha was growing. Vishwanatha proposed his son to get married when he attained the age of twenty, My Dear Son Gunanatha! I'm growing old and your mother is also gradually losing physical strength to manage the domestic affairs. I wish you should get married right away and develop the family. Immediately Gunanatha responded in confirmation to his father's wish, Father! I obey any command from you. Please select a bride of your choice. Vishwanatha was at pleasure on watching his son so submissive at parents, even after winning a huge reputation in the society. Later, he sent messages to relatives and friends seeking them to send details of prospective brides for his son. By a fortnight, Vishwanatha received a number of brides' horoscopes. After scanning, thinking and analysing the horoscopes, Vishwanatha selected a bride for his son. Vishwanatha told his son, Gunanatha! I have selected one most suitable girl for you. If you come out with your opinion I can send information to them. Not a strange reply from Gunanatha, It is all your wish fulfilment that I wish, Father. God Bless You Son he said, I will keep them informed right away. He sent a personal messenger to the selected girl's place along with a detailed letter. Before the next fortnight, bride's parents met Vishwanatha and ratified the marriage proposals. With in one month Gunanatha was married to Sujatha. Gunanatha was pleased and was comfortable with his father's selection. Gunanatha and Sujatha were spending their wedded life in all pleasures. One day Sujatha wished to see her parents once. Gunanatha took his parents' permission and left for in-laws place. Enroute they were passing through a forest. Out of the blues, a demon appeared before the couple. Long before they could think of reacting, the fiend forcibly snatched Sujatha and disappeared. With the unanticipated development, Gunanatha was shocked. For some time he searched all the possible places in the forest for his wife and the demon, in vain. He wailed for losing track of her. He could not understand what to do. He had no answer, if father questions him where is our daughter-in-law? Similarly, his position stands if he proceeded to his in-laws place and they question, Where is our daughter? Instead of facing them without Sujatha, Gunanatha thought to continue the search until he found her. Exploring ways to find his wife, Gunanatha scanned through the forest and reached a near by village. The psychological and physical strain dipped the confidence of Gunanatha by the time he reached that village. Enquiring about Brahmins' in the village, he reached one of their houses. Standing in front of their house he requested for some food. After sometime, the housewife invited him for having meal into the house. Gunanatha requested her to pack his meal, Mother! I did not complete my Sandhya Vandana rituals. Please bundle the food and give me. I will go to the nearest pond, complete my offerings and then I will have meal. The host, on hearing the guest's request packed his meal and handed over. Gunanatha reached a nearby lake and performed his rituals, placing the meal packet under a tree. Later, he opened the package and went to the pond to get some water. It all happened meanwhile. Garuthmantha (Head of birds) was having feast on one of the branches of the tree under which Gunanatha opened his meal parcel. The feast was on a poisonous snake. In the process, the snake's venom dropped from its mouth and got mixed with Gunanatha's food contents. 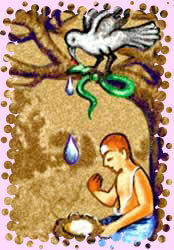 Unaware of this, Gunanatha brought water from the pond and completed his meal. Immediately, he was dead. Now tell me Vikramaditya! Who is responsible for the death of Gunanatha? Who should shoulder the sin of killing the Brahmin? Was it the Brahmin who asked for food? Was it the housewife who packed meal? Garuthmantha or the snake? Vikramaditya smiled and answered, It is right of the starved to ask for the food. Serving meal to a hungry man is right on part of the housewife. Garuthmantha is right to have feast on snake. Snake is also right to discharge venom while fighting for survival. If anyone says that one of these are sinned, then they will be at sin. He continued, It is nobody's sin.